Whenever possible I enjoy making Christmas gifts for my friends and relations. This year has been a slow start in the preparation but now I have got going. I have seen lots of sleeveless Vests/coats on the internet and having browsed through the pattern books came across Kwik Sew K3477 which looked very promising. Would it really be a quick sew? 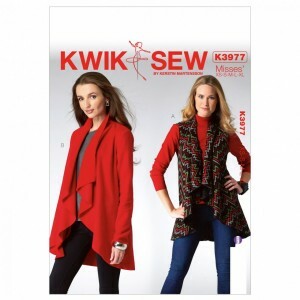 Having made two, yes TWO, versions in approximately three hours I can confirm that the project is definitely a Kwik Sew! For the first version I used a Black wool mix tweed fabric that had been donated by a friend. Having noted that the seam allowances were a mere ¼ inch I cut out the Large size and added ½ inch at the side seams so that I could make faux flat fell seams. The remaining seams were sewn with the overlocker and all outside edges also finished with the overlocker. I omitted the pockets as I wanted these vests to be really streamlined. The second version was cut from some bold Black,Grey and White “tartan” wool blend that I purchased on Saturday from Fabricland’s Salisbury branch. Pattern matching at the side seams was straightforward and having already made the first vest, this second one also stitched up really FAST! So that is two Christmas gifts made, now on to the other dozen!